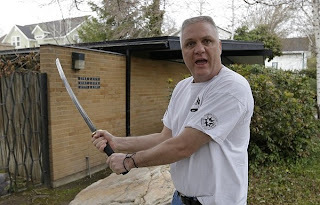 Home » kent hendrix , martial arts , mormons , swords , utah , weird news » Mormon bishop with Samurai sword rescues woman from stalker, takes punk's ChapStick for DNA and screams "YOU ARE SO DONE!" Mormon bishop with Samurai sword rescues woman from stalker, takes punk's ChapStick for DNA and screams "YOU ARE SO DONE!" SALT LAKE CITY (AP) — A Samurai sword-wielding Mormon bishop helped a neighbor woman escape a Tuesday morning attack by a man who had been stalking her. Kent Hendrix woke up Tuesday to his teenage son pounding on his bedroom door and telling him somebody was being mugged in front of their house. The 47-year-old father of six rushed out the door and grabbed the weapon closest to him – a 29-inch high carbon steel Samurai sword. The man ran down the street with the barefoot Hendrix and others in pursuit. Hendrix said he couldn’t catch the man before he fled in his car, but he picked up ChapStick that the man dropped and memorized his license plate. “I yelled at him, ‘I’ve got your DNA and I’ve got your license plate: You are so done,’” Hendrix said. The suspect, 37-year-old Grant Eggersten, turned himself in to police an hour later, said Unified Police Lt. Justin Hoyal. No wonder! Hendrix said this was his first time in thirty years of martial arts instruction that he's ever had to draw his sword. Tip of the hat to the one and only Erik Yaple for such a wacky good find!